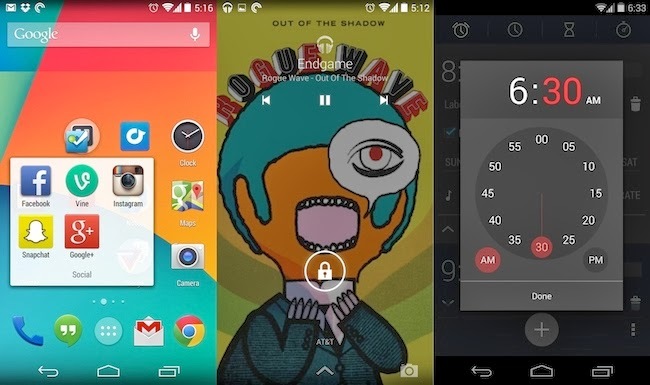 Android 4.4 vs. iOS 7: Which is the Best Mobile OS? When it comes to mobile operating systems, iOS and Android are still the frontrunners. Despite the brilliant and not-so-brilliant efforts of Microsoft to topple the two giants, the mobile market space is dominated by Cupertino and Mountain View. iOS, which made its beginnings in an era where touch-screen smartphones was a relatively new concept. With the late Steve Jobs at the helm, Apple was instrumental in starting what we now call the smartphone revolution. iOS with its brilliant and shiny design wowed many users thus catapulting the company into the role of a technology giant. As iOS was soaring at a breathtaking pace, a little-known open-source operating system was making its presence felt ever so slightly. Neither Steve Jobs nor the open-source community could guess how the mobile market space would change in the next few years. Time passed and iOS continued its dominance. But this time, the presence of a new predator was more palpable. Android wasn't just an open-source project tinkered about by hackers, it was a tangible threat to Apple's deadly dominance. With the death of Steve Jobs came a loss in market share. A loss very few had imagined a couple of years ago. Samsung kept making phones after phones and the crowd that once worshipped the Cupertino gods now hailed the Korean giant as their new messiah. In this raging battle, though, only one thing has been instrumental in letting these two companies spar against each other with such ferocity. And that weapon is the operating system. The reason both iOS and Android are the top is solely because of their amazing operating systems. That's why no Apple vs. Android fight is complete without a comparison between their operating systems. So, here we are with a sweet comparison between Android 4.4 KitKat and iOS 7. Since Sir Jony Ive took over the design department, everything has changed. No longer do we see the gaudy skeuomorphic design that Scott Forstall was known to be a fan of. The design is flat, clean, and yes, refreshing. One of the most striking things about iOS 7 is that it features a design that uses a modern palette of colors, less gradients, and more flatness. That said, as good as the design seems, it is marred by inconsistencies. In fact, the UI is so jarring at times that many people have parodied it. 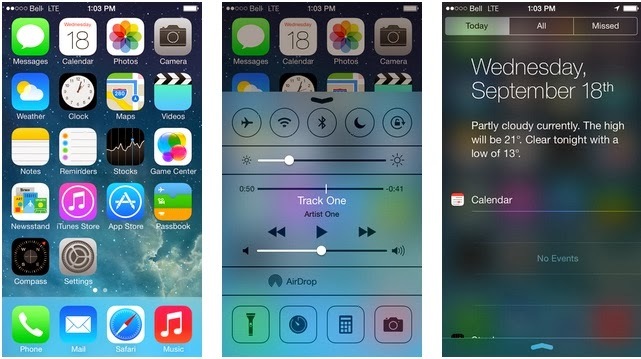 Furthermore, we're yet to see a significant number of apps that make full use of iOS 7s brilliant design. Coming to Android's design, things haven't always been pretty in the open-source world. In the beginning, Android looked like a developer's device that was followed by a slight design overhaul that made it the poor man's iOS. Till Android 4.0, though, Android was considered a poor contender when it came to design and its lack of aesthetics was a major bottleneck as far as wowing the iOS crowd was concerned. That all changed, however, when Android 4.0 was launched. With Ice Cream Sandwich, Android took a major detour and put most of its focus on improving the design of the operating system. Slowly and steadily things improved and soon Android came to be considered as one of the most beautifully designed mobile operating system. With KitKat, this legacy continues as Google refines and polishes Android to the max thus making it a treat for users. One of the first things you'll notice in KitKat (if you're using a Nexus device that is) is its consistency. From status bars to icons, everything is consistent, which definitely is a far cry from Apple's inconsistent design. The design of Android has improved so much so that there is even a blog documenting the most beautifully designed Android applications. While we can expect iOS7 to improve very quickly in the future, but this department, surprisingly, has been conquered by the now mighty Android. When it comes to functionality, Android triumphs again with its ease of use and omnipresence of Google services. Search is Google's biggest strengths and KitKat makes sure that it is with you, everywhere, no matter where you go. Also, another big functionality is its ability to let users share data from one app to another. Let's say you found a picture in your gallery, you can then choose to share it with your friends using any app you want. On iOS7, however, you can share your data with a limited number of applications. Another functionality area where Android scores is the integration of apps with core elements like the lock screen and the bottom buttons. The music you're playing completely takes over the lock screen in the most beautiful way you can imagine. Furthermore, the soft buttons at the bottom provide a seamless integration between the hardware and software. The iOS's big round button simply fails to captures the ease of use and functionality the dynamic soft buttons provide. In short, KitKat takes this one too. Both Android and iOS come with core apps that provide unrivaled features. You can control everything by simply swiping up and down the screen. Secondly, you'll find that both Android and iOS are pretty mature operating systems that know what features the users need. So, in this department, there's no point contesting between the two. Android 4.4 and iOS7 are completely different operating systems. However, they have one thing in common and that is optimization. KitKat and iOS7 have been optimized to run on older devices thus marking a major change in strategy by both mobile giants. Google, with its fragmented userbase is in dire need of an OS that shows up on all devices. Apple, on the other hand, wants to ensure that the new iOS 7 gets adopted by as many people as possible. These goals have ensured that both Android 4.4 and iOS 7 perform their very best even on older devices. When it comes to default applications, there's an undisputed winner here and that is Apple. iOS is known for its fabulous default applications that integrate tightly with the rest of the operating system. Be it the famous camera roll or the iMessage app, everything not just blends in but also works as it should. Even if we consider the default browser, that is Safari, it is much more stable and faster than Chrome. And last, but not the least, iOS features a camera app that Android, thus far, has failed to match up to. KitKat, though brings along applications that are perfect for the Google-loving users, it is not as good as Apple. The Hangouts app that bakes in SMS and Google Talk is clumsy and is confusing at times. Also, the camera app, which, though improved, is no match for the amazing quality of its iOS counterpart. The same thing about Chrome. Chrome, though offers a lot of nice functionalities, is a tad slower on most devices (well, at least slower than Safari.) Undoubtedly, the winner in this area is Apple. The most important feature, as far as Google's strategy is concerned, is Google Now. Google Now is not just a search functionality, it's also a personal assistant that gives you relevant information when you need it and where you need it. By gathering data about your transit and your habits, it serves as an intelligent personal assistant that does the work for you. Siri, on the other hand, is much more passive. Though updated with the latest search functionality, Siri still lacks the proactivity that Google Now has. It's still "voice search" in its purest avatar. In searching for relevant information, yes, Siri has the upper hand. However, if you wanted a personal assistant, Google Now is your best bet. 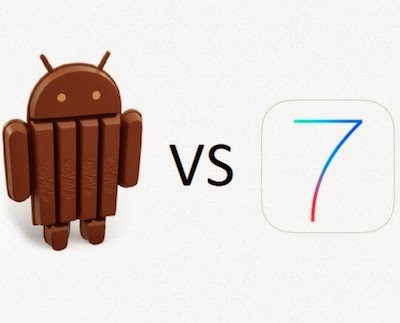 Both iOS 7 and Android 4.4 KitKat are solid mobile operating systems. They are both mature and have navigated safely across some of the most tumultuous periods in the smartphone wars. This is exactly what makes them so popular. When compared to Windows Phone OS, for example, they always have the better apps, the better design, and the better functionality. This means that unless another strong contender comes along, the war will always be between Android and iOS for the next few years to come. As for the stronger one between them, this time, we'll have to hand it to Android. Areas like design and performance, which were once its weak points, are now its strong points. That said, iOS 7 is still a solid operating system, and Android will have to do much more to keep its winning form.